Indie-Music has been serving musicians and the industry that supports them since 1996. As a respected industry source, we offer our advertisers and clients premiere exposure to our music-targeted website audience, as well as emerging social media and mobile syndication markets. 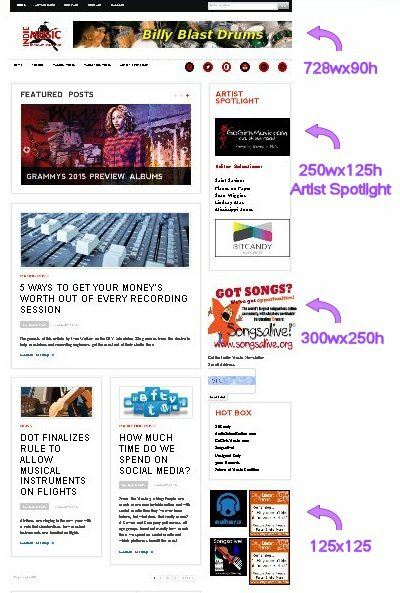 SPONSORED BLOG POSTS - $129/post with 72-hr lead time Includes: Guaranteed placement within Artist News/Reviews section; text and images/video links must be supplied by advertiser. Includes two (2) dedicated social media blasts to be scheduled at time of request. Does not include CD/music review; advertorial post only. Perfect for crowdfunding campaign promotions, songwriting competitions, festivals/conferences, artist services and gear features - reach your target audience! We offer quantity and frequency discounts on all sizes. The more you buy, the larger the discount. Serving music creators and the industry that supports them since 1996, Indie-Music Publishes the Latest News on how to Make and Market Music, Profiles the Best New Tools of the Trade, and Presents the Most Interesting People and Topics Trending in the Music Industry.